Codman 64-2512. Codman 36-2018. Codman 36-3005. Codman 36-2020. Surgical direct SDA297. Dan Batson, DGD Inc. Item is sold as described. IT INCLUDES ONLY WHAT IS PICTURED. "The sale of this item may be subject to regulation by the U.S. Food and Drug Administration and state and local regulatory agencies. RELY ON THE PHOTOS, THEY WILL SHOW WHETHER THIS ITEM IS COMPLETE OR INCOMPLETE, AND IT IS ALSO THE ITEM YOU WILL RECEIVE. Dallas, TX 75216. All In good condition. Suit Case Full. The sale of this item may be subject to strict regulations by the U.S. Food and Drug Administration and state and local regulatory agencies. FDA Regulation and Certification. DOES NOT HAVE TURN KEY. OTHERWISE In good working condition. FDA Regulation and Certification. The sale of this item may be subject to strict regulations by the U.S. Food and Drug Administration and state and local regulatory agencies. Codman Silver Plated Malleable Mayo Common Duct Scoop. NOS (new old stock) in the original package as pictured. We opened one to take pictures. Size large measures 10-1/2" / 26.7cm in total length. Scoop measures 13mm in length x 7.4mm in width. MPN: 76-4027 Shipping Weight: 1 lbs..
Codman Classic Plus 36-5016 Curved Metzenbaum Scissors, TC Edges, 7"
Warranty: 6 Months (Covers OEM Defects). Overall Length: 7“ / 18 cm. CODMAN CLASSIC PLUS 36-2018 MAYO HEGAR NEEDLE HOLDER, 8"
1 - CODMAN 36-2018 MAYO HEGAR NEEDLE HOLDER, 8". German stainless. 141 Arkwright Rd., N. Chesterfield, VA 23236. Anne Miller-Schlenk. "The sale of this item may be subject to strict regulation by the U.S. Food and Drug Administration and state and local regulatory agencies. T he sale of this item may be subject to strict regulation by the U.S. food and drug administration and state and regulatory agencies. Codman 36-1016 Halsey Classic Plus Needle Holder, TC Smooth Jaws, 5"
Warranty: 6 Months (Covers OEM Defects). Overall Length: 5“ / 12.7 cm. All devices are thoroughly cleaned to manufacturer specifications and inspected before listed for sale. T he sale of this item may be subject to strict regulation by the U.S. food and drug administration and state and regulatory agencies. You are buying 1 very lightly used Codman #46-3244 Orthopedic Spine 13 1/4”, 33.7 cm 25mm. In Excellent condition. The sale of this item may be subject to strict regulations by the U.S. Food and Drug Administration and state and local regulatory agencies. Any used product. Administration and state and local regulatory agencies. If so, do not. subject to FDA regulation, I will verify your status as an authorized. Item Condition.Used and in Good Condition. SORRY FOR THE INCONVENIENCE. Units were removed from a working facility and appear to function as intended. No further testing can be conducted. Codman - Sarot Bronchus Clamp. 1.5" (3.8cm) jaw length. T he sale of this item may be subject to strict regulation by the U.S. food and drug administration and state and regulatory agencies. Codman Cervical Retractors - 50-1341. All devices are thoroughly cleaned to manufacturer specifications and inspected before listed for sale. T he sale of this item may be subject to strict regulation by the U.S. food and drug administration and state and regulatory agencies. Codman - DeBakey Classic Tangential Occlusion Clamp, 1 x 2 vascular teeth. Jaw length 3" (75mm). Jaw depth 5/8" (15mm). 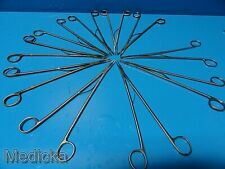 This listing is for 1 high-quality, made in USA Codman 7” needle holder. 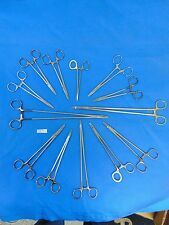 It is in used condition.Feel free to check my other listings for a variety of other surgical instruments.Please check the photos and ask any questions before bidding, as this item is not returnable. I'm happy to offer combined shipping discounts if you win more than one auction; just request an invoice before paying. Thank you for looking! i do not ship international. THEY ARE 6" IN LENGTH. THE REFERENCE NUMBER FOR THESE ARE 64-2512. You will not be disappointed. I WANT TO MAKE YOU HAPPY AND FIX THE ISSUE. I WANT TO HELP! You'll receive exactly what you see in the photos. Completeness: (with everything seen in the pictures. The sale of this item may be subject to regulation by the U.S. Food and Drug inistration and state and local regulatory agencies. ). 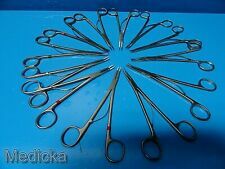 This is for a Codman Surgical 21.5cm Titanium Needleholders With Catch. "The sale of this item may be subject to regulation by the U.S. Food and Drug Administration and state and local regulatory agencies. 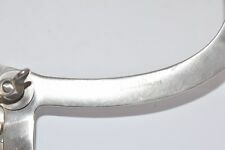 This is for one,Codman Shurtleff Universal Punch Handle. With our dynamic pricing model, our prices are always competitive. You're already purchasing the item. Item MPN: Does not apply. These scissors are in good condition and very sharp. Jaws align perfectly. They are not bent or dented. "The sale of this item may be subject to regulation by the U.S. Food and Drug Administration and state and local regulatory agencies. Codman 50-1356. Codman 50-1384. Cervical Retractor Small 3 3/4". Set Includes Doing that is against U.S. and international laws. The sale of this/these item(s) is/are subject to regulation by the U.S. Food and Drug Administration and state and local regulatory agencies. Codman 37-1025 Stainless Steel Lambert-Kaye Classic Aorta Surgical Clamp,1x2 Vascular Teeth, Jaw Length 2", Jaw Depth 3/4", Total Length 7-3/4". Material Stainless Steel. MORE GOOD INFORMATION Latex or Latex-Free Latex-Free. Material Stainless Steel. I WILL DO MY BEST TO DESCRIBE THE ITEM TO THE BEST OF MY ABILITY. Length 9-1/2". "The sale of this item may be subject to regulation by the U.S. Food and Drug Administration and state and local regulatory agencies. For sale is a Codman 366-2000 Classic Plus Crile-Wood Needle Holder. 15cm (6”) length. Item is patient-ready and has been fully inspected and tested for proper operation. "The sale of this item may be subject to regulation by the U.S. Food and Drug Administration and state and local regulatory agencies. THIS IS BEING SOLD AS-IS WHAT YOU SEE IN THE PICTURE IS WHAT YOU WILL BE GETTING. Any used product. has been cleaned/sterilized per manufacturers specifications. Administration and state and local regulatory agencies. If so, do not. Has been cleaned/sterilized per manufacturers specifications. Any used product. subject to FDA regulation, I will verify your status as an authorized. This is for one: Codman 50-2608 Ragnell Double End Retractor. "The sale of this item may be subject to regulation by the U.S. Food and Drug Administration and state and local regulatory agencies. The sale of this item may be subject to strict regulation by the U.S. Food and Drug Administration and state and local regulatory agencies. Regulation / Certification. For this, we are highly appreciative. Codman 36-2002 Crile-Wood Classic Plus TC Needle Holder, 8"
Warranty: 6 Months (Covers OEM Defects). Overall Length: 8“ / 20.3 cm. 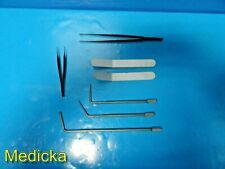 (1x) Codman 46-3151 Karlin Cervical Curette, Forward Straight, 0. (1x) Codman 46-3152 Karlin Cervical Curette, Forward Straight, 00. 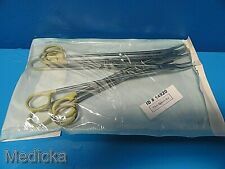 (1x) Codman 46-3153 Karlin Cervical Curette, Forward Straight, 000. CODMAN CLASSIC PLUS 36-2016 MAYO HEGAR NEEDLE HOLDER, 6"
1 - CODMAN 36-2016 MAYO HEGAR CLASSIC PLUS NEEDLE HOLDER, 6". 1X2 VASCULAR TEETH. JAW LENGTH 1-13/16". Material Stainless Steel. MORE GOOD INFORMATION Grade Premium OR-Grade. USA RESIDENTS ONLY Sterile or Non-Sterile Non-Sterile. Overall Length 6" (152mm). Material Stainless Steel. I WILL DO MY BEST TO DESCRIBE THE ITEM TO THE BEST OF MY ABILITY. MORE GOOD INFORMATION Grade Premium OR-Grade. USA RESIDENTS ONLY. Codman 23-1002 Scoville Angular Cup Ruptured Disc Curette, 10"
Angled cup. Overall Length: 10“ / 25.4 cm. Warranty: 6 Months (Covers OEM Defects).